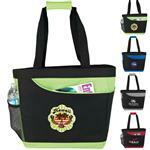 A convention and trade show tote that is actually functional! How often have you needed to dig into the bottom of your tote looking for a pen to take a quick note? Open main compartment with 11" handle drop height. Front Velcro pocket and pen loops! 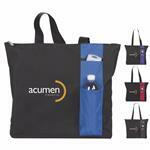 A great custom convention tote bag and tradeshow bag. Strong and reliable. Production Times Available: 1-Day Rush Production Available. Centered on BACK L 8" x H 5"
Centered on Front Pocket L 8" x H 5"
Available Imprint Options: Silkscreen, Full Color Imprint, Embroidery, Epoxy Dome. 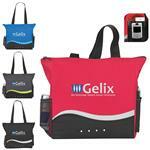 Materials: 600d PC and non woven material.